Most people are unaware that swimming pools originated over 5,000 years ago. The first public bath (aka swimming pool) was The “Great Bath” in Mohenjodaro in the province of Sindh, Pakistan. around 2600 B.C. Furthermore between the sixth and eighth century, the affluent Greeks and Romans used swimming pools prominently as well. Many of these were typically great bodies of natural clean spring water used as a gathering place. The first man made pools were revealed in the 1800s in London and were used for swimming competitions. The first recorded swimming races were held in Japan in 36 B.C. It wasn’t until 1896 however that swimming competitions were introduced into the Olympics in Athens, Greece. 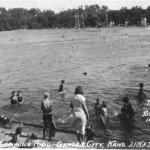 As you can see the history of swimming pools dates back quite some time. The history of swimming pools in the U.S. is quite young comparatively much like our nation. The first inground pool was introduced in Texas in 1910. It was commonly known by the name of Deep Eddy and is still operational in Austin to this day. In Philadelphia, the first above ground pool came into fruition in 1907. Following WWII, swimming pools soared in popularity especially for the wealthy. Today there are more than ten million swimming pools in the United States and over 360,000 that are open to the general public. President Ford had an outdoor swimming pool built at the White House in 1975. The first swimming pool on an ocean liner was built in 1907 on the White Star Line’s Adriatic. Sixty five percent of Americans don’t know how to swim. The bikini swimsuit acquires its name from a U. S. nuclear testing site in the South Pacific called Bikini Atoll. Florida is the only state in the United States that had a law on the books that requires Life guards and swimming instructors to be certified. An Olympic swimming pool can hold between 700,000 to 850,00 gallons of water! With such a deep rooted history of swimming pools spanning the globe it is obvious to see that swimming is one of the most popular recreational and therapeutic activities enjoyed today. The advancements in swimming pool technologies has come a long way with almost every customizable feature you could possibly dream of when it comes to your personal swimming paradise. That being said the basic principal is the same. Get out with the loved ones relax and have a good time. A lasting smile on the face is priceless. Take a look here this years swimming pool trends we were able to take part of. It is obvious our era will have made a huge impact on the history of swimming pools . In reality, we all have heard a few swimming pool myths . 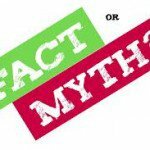 Today, we will take a look at some of the most common and decipher if they are truly myths or actual interesting facts. You should wait at least an hour after you eat to swim otherwise you may get cramps. The truth behind this assertion is that after you eat and you are in the process of digesting food, more blood is diverted to your stomach instead of your muscles. If you actively engage in swimming, there is a small chance you might encounter a cramp. To avoid this possibility, it is advisable to eat a small meal before entering the pool. There is factual evidence behind this claim however the risk is very low and cramps from eating a meal and swimming are very uncommon. When you can smell chlorine in the pool, there is obviously too much in the water. One of the more interesting swimming pool myths . In reality, the opposite is the case. When there is chlorine in the pool, they attach to bacteria and create chloramines. However, when you shock the pool by adding more chlorine, these chloramines are transformed into oxygen and dissipate into the air. When you can smell it in the air, it is really not in the water where it is supposed to be. Take a look at the details within your Utah swimming pool chemistry. The chlorine will turn my blond hair green! Instead of blaming the chlorine, it is actuality the copper minerals you need to be blaming. Some of the algaecides are formulated with copper and can attach themselves to the protein in your hair. However, don’t fret. To alleviate this problem, use a shampoo that strips the color or condition your hair prior to swimming and you should be just fine. If you open your eyes underwater, the chlorine will burn your eyes. Instead of falsely blaming the chlorine, it is actually acidic water with a low PH. This is as a result of excessive rain water. To alleviate this, sodium bicarbonate and a PH increaser should be added. 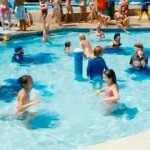 This is one of the most commonly misunderstood swimming pool myths with an easy solution. Don’t underestimate the importance of pH in your swimming pool. If anyone pees in the swimming pool, blue dye can detect your urine. It is one of the oldest scare tactics anywhere. What is completely astounding is that fifty two percent of adults believe in this outrageous myth. We’ve never seen nor would we want to see blue urine dye in a swimming pool. Definitely one of our favorite swimming pool myths and we don’t believe it will go away anytime soon. So there you have it. Many misconceptions behind these common swimming pool myths. Now you know the truth for some of the oldest myths in the book. Do you have any other swimming pool myths we’ve forgot to cover? Let us know!